We had a customer come in cold just from reading he blog where he determined we could do all the things he needed to upgrade his Grand Banks 42 to the condition that it should be in. There were various cosmetic defects with the boat — all common to the Grand Banks of that era. Deteriorated teak decks, bad window tracks, spent gelcoat and varnish all added up to a boat that was in need of a bit of help. Our first order of business was to remove the teak decks as they were beyond the point where we could bring them back to a useable state. 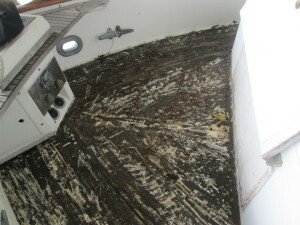 The customer agreed that a maintenance-free Awlgrip deck would be much better than a deck he had to maintain. 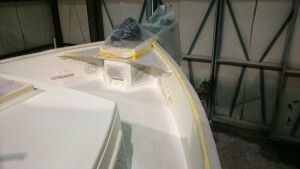 We used a traditional moon-dust color Awlgrip for the surface because it is a Grand Banks traditional deck color on many boats. To repair the gel coat repainting was necessary as the gel had gotten too thin to compound out to a shine again. Since we were replacing window tracks at the same time it made sense to get the superstructure prepped and primed and then after the windows were reinstalled to paint the frames at the same time. This way we would end up with a seamless finish. 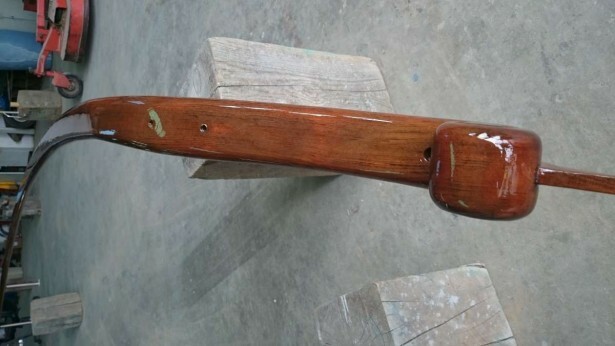 To avoid cracking from the slight wood movement, the frames are epoxy coated before painting. And since the superstructure and deck were both being painted the prep work could all be done at once. 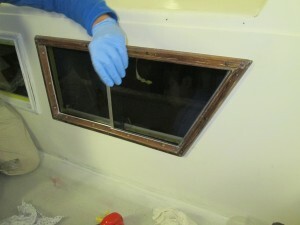 If you are considering replacing your window track it makes sense to change your glass out to tinted lo-UV glass protect your boat’s interior, make it easier to cool and add a bit of privacy. During all this the varnish was stripped and built up to 8 coats for a luxurious finish that would rival any boat on the water.